For the past several months I have been collaborating with a small school in North Carolina that has a long and cherished culture that honors the individual child above all else. Thoughtful and reflective, the teachers are aware that in other schools children engage in deep, collaborative investigation, and they are wondering if they are missing an important experience for the children. There are twelve children at Children First. There is a poster on the wall there that says, in effect, that they are not one school, but twelve individual children, each named on the poster. During my first visit to the school, I challenged the teachers to consider whether they could grow their lens to include a thirteenth child…the group. “The group” may be understood in different ways…and, in fact, it is not one entity but many, or at least the possibility of many. Sometimes “the group” involved in an investigation is everyone, in the sense that everyone in the class is emotionally and cognitively involved with the question at hand, if not physically. The actual work in a group investigation, though, more often tends to be done in small groups, often three to six children. An investigation might have multiple parts; different small groups may form to engage with different parts of the investigation. To keep everyone “in the loop,” the small groups may present their work to the whole class periodically, to keep everyone up to date. 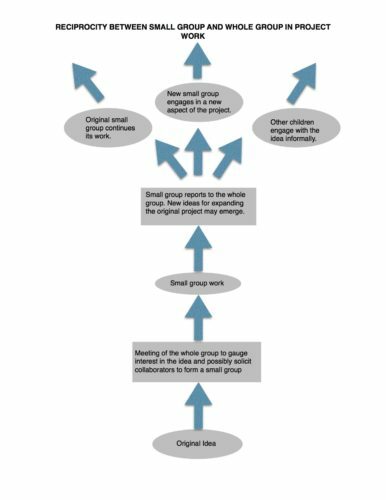 And so there is often a flow in project work, back and forth between different group formations. For example, three children hatch an idea for a collaborative project while playing at the block platform. The teacher invites them to tell about their idea in the whole group meeting and to ask if others are interested in collaborating. OR The teacher meets with just the three children and asks if they would like more collaborators. She may have some friends in mind for this, or she may have a conversation with the three to see whom they would like to invite into the group. At some point, or maybe at several points, the project group (now maybe six children) presents the idea and their work to the entire class. Perhaps the class has a conversation in which ideas emerge to expand the scope of the project. If the original group is still in process and requires the attention of the teacher, perhaps these new ideas are put aside temporarily, to be revisited as soon as a teacher can be free to support the work. Or perhaps the original group can work on its own now and a new aspect of the project can begin right away. 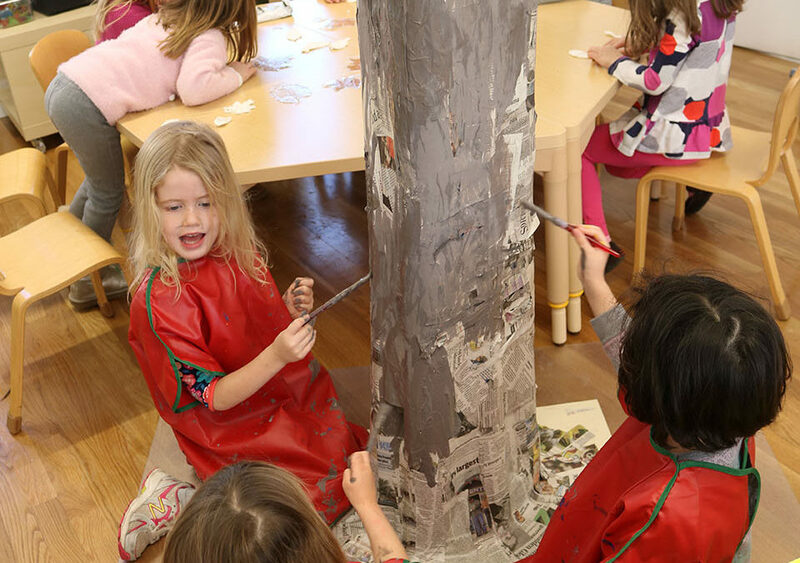 Regardless, the teacher will not be surprised to see expressions of the idea emerge in children’s self-directed play and representation, perhaps for long after the original project has run its course. You can find an example of an investigation in which work on many aspects happened in many different group formations in this blog (The Cardinal Project). Each individual in a project group brings his or her experiences and knowledge to the others in the group, thereby inspiring them to think things they might not otherwise have thought. In this way, the individual both enriches and is enriched by other individuals in the group. But there’s more. As the group works together, they co-construct knowledge together, creating a sort of group knowledge. So now, in a group of six children, we have the collective knowledge of six individuals and the knowledge of the group as a whole. This group of six holds six individual identities. But the group has an identity of its own, as well. The children themselves co-create this identity and find power and pleasure in both owning it and belonging to it. If we consider the group (in whatever formation) “the thirteenth child,” the individual children, the group, AND the project all benefit. The group also has a sustaining ability often greater than that of a child on her own. Enthusiasm and persistence shared can overcome sticking points and problems encountered in the course of the project. 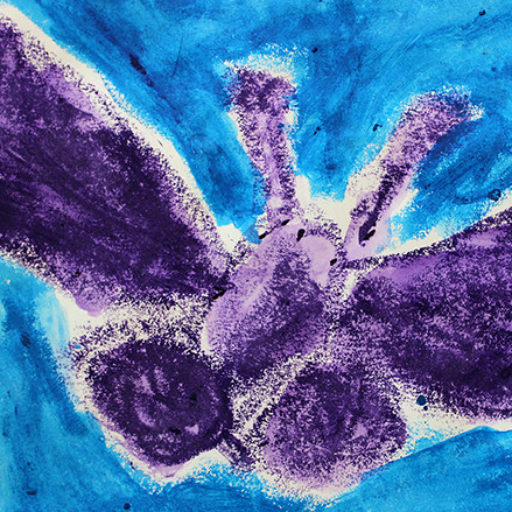 Children in a group bring the perspective of “the other” to each other. Working within a group requires children to articulate their points of view and listen and respond to the perspectives of others. In the context of a group adults can help children learn to have cognitive dissonance without emotional dissonance, or at the very least, learn to tolerate and work through emotional dissonance. Group project work is an ideal environment for learning to negotiate and to compromise, as the integrity of the group relies upon a certain amount of agreement, and the integrity of the group is important to those who belong, who identify themselves as members of the group.